3-D radicals were made by bending metal poles into different angles, shapes and sizes; they are scattered and overlapping randomly but elegantly, creating a surreal and dreamy atmosphere. White Chinese radical decorations stretching across ceilings and walls. Long rectangular boxes stagger on top of one another to form the Ticket Office table, resembling the elongated three-dimensional radical decorations on the ceiling. Custom-made long benches in the lobby allow the audience to relax and enjoy the decoration. They are actually cylindrical Chinese radicals, acting as another form of representation of the theme. Neon lights are used to construct the signage, enabling it to stand out from the background. Its shape harmonizes with the radical decorations, creating an integrated feeling in the entire area. 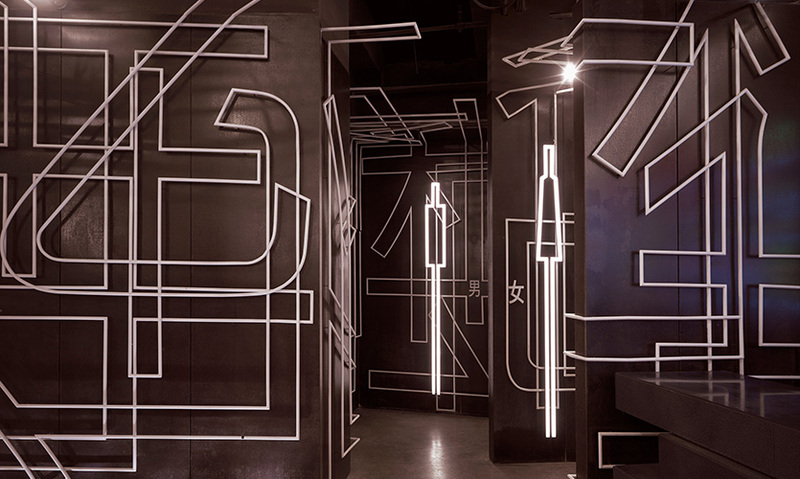 Stylish neon signages are also used for the washroom, echoing the style of the Chinese radical decorations and at the same time stand out from the background. 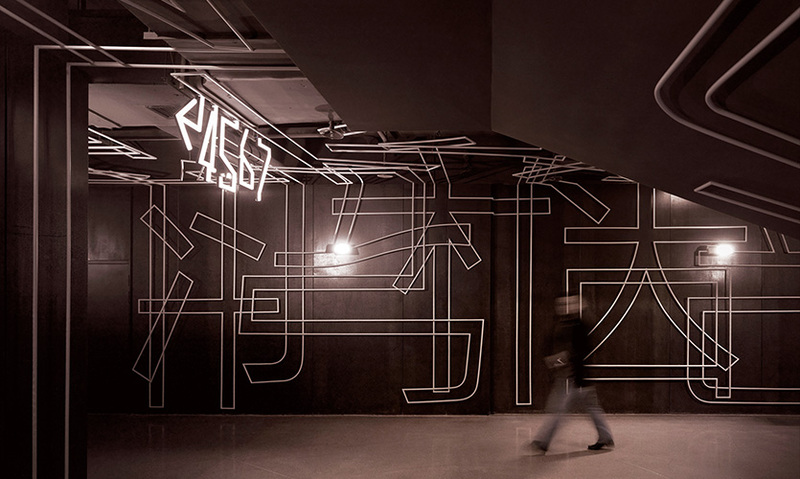 The theme of Chinese radicals extends toward the corridor, demonstrated through the white frame Chinese radical installation on the wall. The floor was finished in dark brown stone terazzo, where metal trimmings highlight the Chinese radical floor pattern, echoing the decorations on the ceiling and wall. Script-writing is usually the first step of film production. 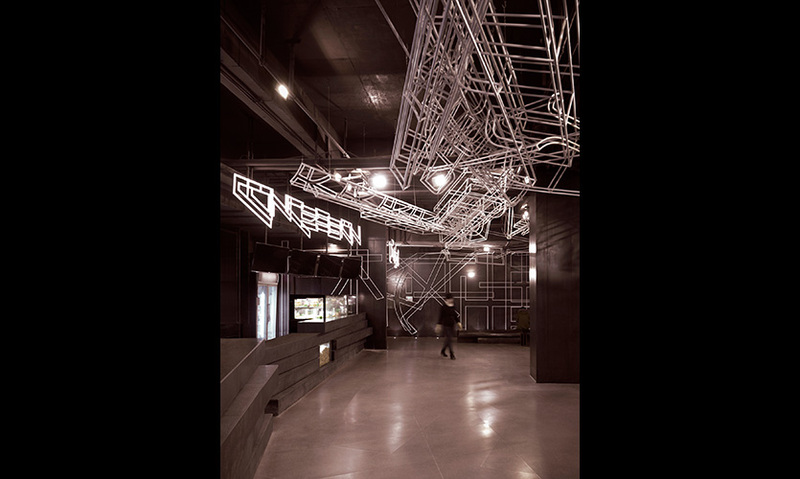 The One Plus Partnership Limited design team thus incorporated this element into the design of this cinema project. Breaking down scripts into smaller elements, Chinese characters are used as a representation of script-writing. Characters are a meaningful element that represents Chinese culture, but at the same time can be a cliché theme in Chinese culture. Many projects incorporate Chinese characters in their designs, for example on wallpapers and decorations, so the prevalence of these motifs made it a big challenge to outshine the many existing examples. Chinese radicals are the roots of the formation of Chinese characters; each of them carries a unique meaning and can be grouped in different combinations to create different Chinese characters with new meanings. 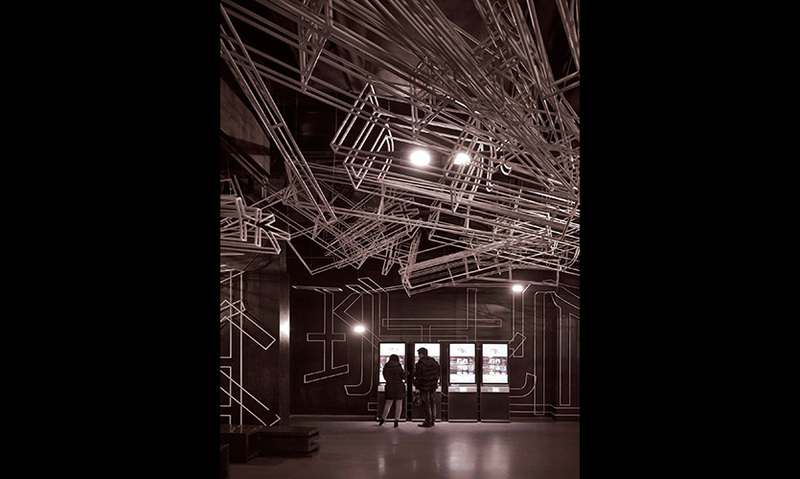 This three-dimensional installation of Chinese radicals can be found throughout the cinema perimeter as if the audience is wandering through the pages of the script. As visitors enter the cinema, they can see white Chinese radical decorations stretching across ceilings and walls. 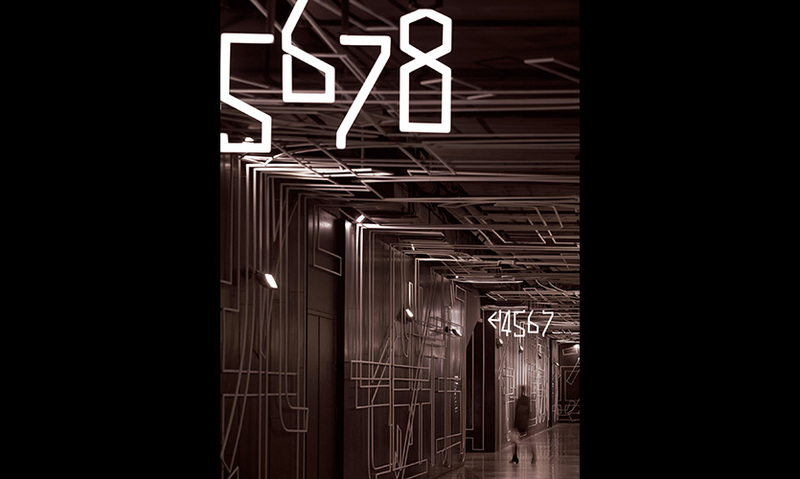 In the lobby, the radicals become three-dimensional and are hung from the ceiling. These radicals are made by bending metal poles into different angles, shapes, and sizes; they are scattered and overlapping randomly but elegantly, creating a surreal and dreamy atmosphere. 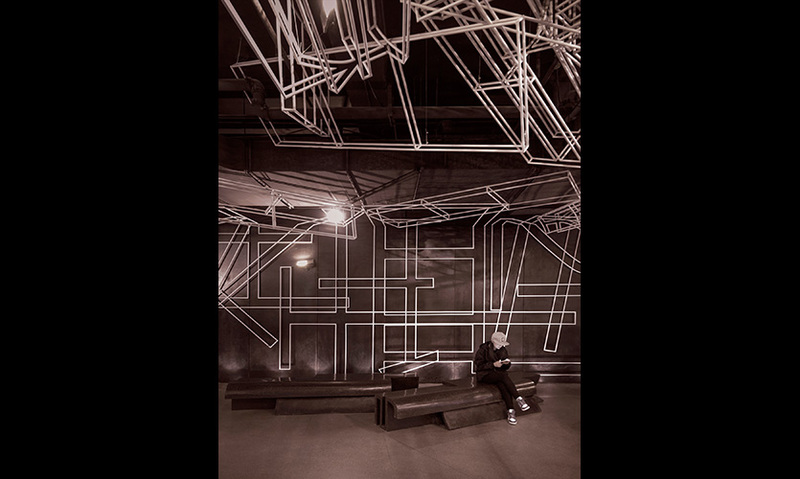 The pattern of the floor and walls of the cinema also relates to the theme of Chinese radicals. The floor was finished in dark brown stone terrazzo, where metal trimmings highlight the Chinese radical floor pattern, echoing the decorations on the ceiling and the wall. Brown and gray acoustic panels have been applied to the wall, piled in different thickness to create popped-up Chinese radicals. Long rectangular boxes stagger on top of one another to form the Ticket Office table, resembling the elongated three-dimensional radical decorations on the ceiling. The designers have placed long benches in the lobby, which allows the audience to relax and enjoy the decoration. These custom-made benches are actually cylindrical Chinese radicals, they act as another form of representation of the theme. The signage of the Concession Area and Ticket Office are in English, which contrasts with the Chinese radical decorations. Neon lights are used to construct the signage, enabling it to stand out from the background. At the same time, its shape harmonizes with that of the radical decorations, creating an integrated feeling in the entire area. The execution of the design concept was extremely demanding and required skillful workmanship to create unprecedented installations. It was also necessary for the designers to make the right choice of materials and production methods. The design team maintained clear communication with the construction team, providing for a 95% accurate portrayal of their design in the final product versus the rendering proposal. 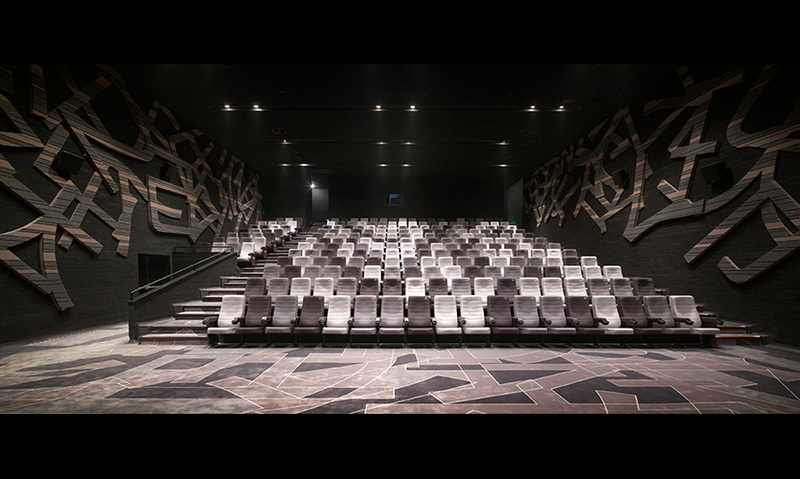 These innovative cinema designs by One Plus have created a new trend in the cinema industry in mainland China, which enrich the audience’s viewing experience and attract more customers. 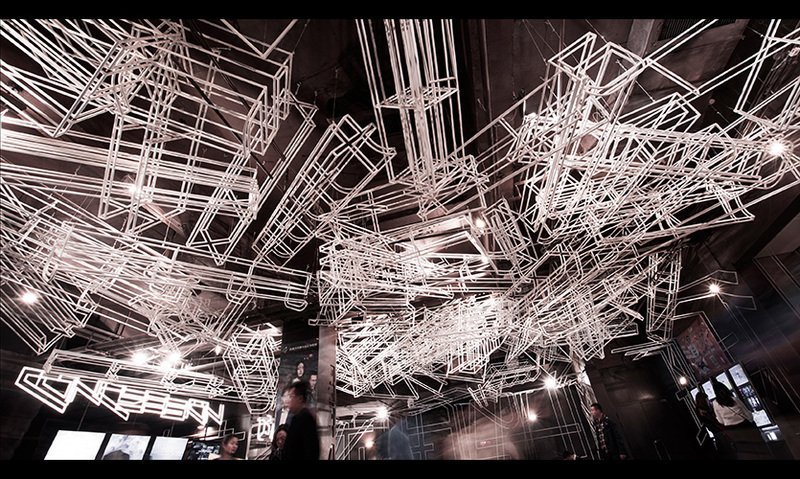 "A bold and innovative installation in both scale and technique. 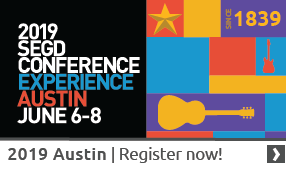 The manipulation of the Chinese characters in both two and three dimension is immersive and absolutely wild!" "The sheer scale of the extruded sculptural forms are very impressive and the suspended typographic forms create an engaging, chaotic canopy." Wuhan JinPu Building Decoration Engineering Co Ltd.